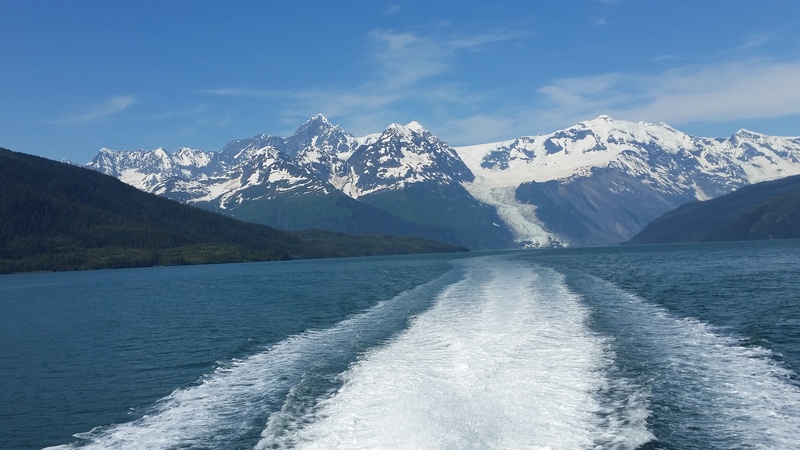 June of 2015 saw Nan and I head Way up “North to Alaska”. The flight from Melbourne was via Sydney and Vancouver. 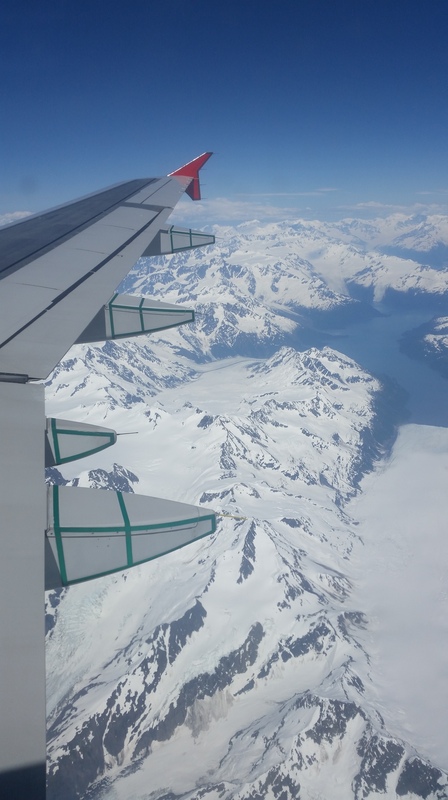 From a 7:00 am departure from Melbourne, we arrived in Anchorage Alaska mid afternoon on the same day but some 26 hours later. Time travel? We stayed at the Artic Fox B&B in Anchorage; within easy walking distance of the city centre and only a short drive from the airport – Anchorage is not a big city! It is similar in size to some of the regional towns in Victoria. The city centre is laid out in a grid system of roads, some with names, others identified by numbers, east and west with alternate streets being one way. Our trusty steed was a Chevrolet Sonic 1.4 litre turbo charged hatch. The amusing thing is that it took us a few days to work out that there were back doors and they did in fact open – thinking passengers would have to squeeze in by sliding the front seats forward! We visited Whittier to the east and Denali National Park to the north, saw lots of wild life, trekked on glaciers and did some walking. Over this summer period, Many of the Alaskan roads were undergoing repairs and there were significant delays with both road works as well as bush fires. We experienced the Summer Solstice with 22.5 hours of daylight. This and the noise of freight trains sounding their horns meant some disturbed sleep patterns. Alaska is not associated with SOTA (Summits on the Air). If it were, then by my observation, many of the peaks would be inaccessible to all but the most intrepid mountaineer types. The access window would also be quite narrow. 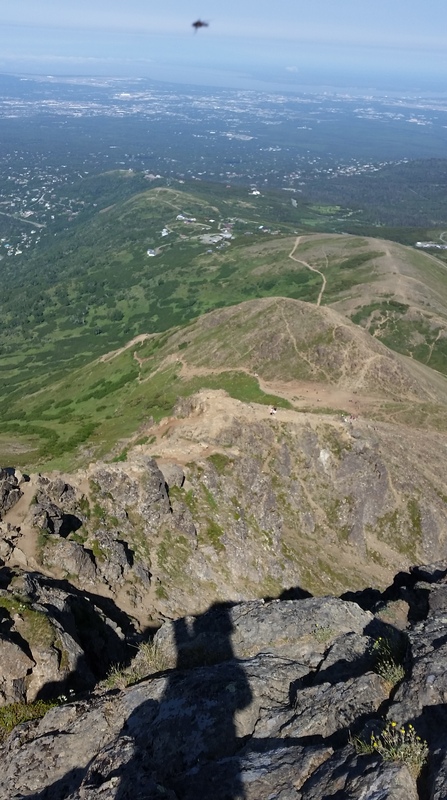 Flat Top Mountain is located on the eastern fringe of Anchorage in the Chugach State Park; is 3,510-foot (1,070 m) It is the most climbed mountain in the state. It is usually reached by driving to the Glen Alps trailhead and following a well-maintained 1.5-mile (2.4-km) trail, with an elevation gain of 1280 feet (390 m) from the parking lot to the summit. It appears from SOTA maps that even Flat Top mountain would not rate as a SOTA summit due to 150 metre prominence requirements; there being a saddle at approximately 3260 feet (993m) then rising ground along a ridge line to the SSE with another non qualifying summit at 3620 feet (1103m) before culminating at what would qualify at 4460 feet (1360m). Very noisy trying to operate from our B&B in Anchorage. Tried also from McKinley Creek near Denali with only one incomplete 20m CW contact into central USA. Even here the bands were very noisy and unsettled, possibly due to several recent CME events. No Auroras viewed due to the near constant daylight at 63 degrees north. Nan and I returned to Vancouver to catch up with our son Cameron who has now just completed a post graduate degree in 3D modelling with the Vancouver Film School. 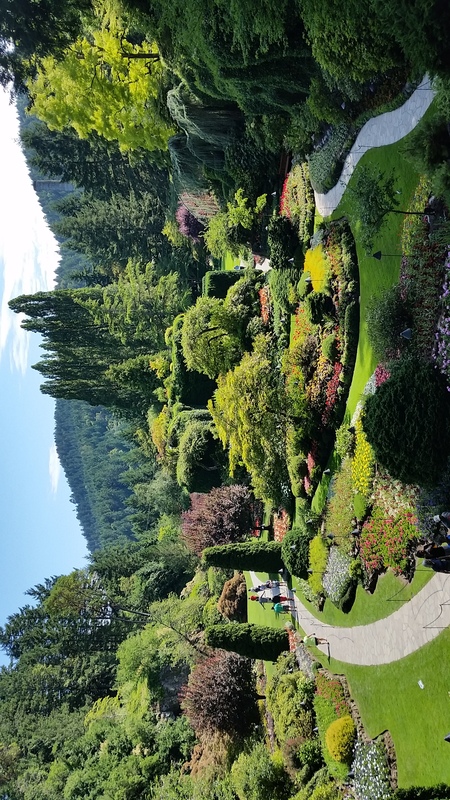 Whilst in Vancouver, we visited Victoria on Vancouver Island with the Butchart Gardens being a real highlight. Nan decided to sample the variety of ciders available at the Bard & Banker Irish Pub over lunch. I also activated Burnaby Mountain (370 metres); an easy 1 point summit inside the grounds of Simon Fraser University and accessible via the #135 bus along East Hastings St.
We got off the #135 Bus at its second stop inside the university where there were a number of bus bays. A quick look at the GPS indicated we were inside the activation zone so rather than finding the actual summit near some water tanks, we hopped over the road to a vacant park and set up on its edge near some trees at 355 metres. I was able to time the activation with the bus schedule; the bus arriving just as I had finished packing up. Another advantage here was getting all of our mornings travels on the one ticket, it lasting 1.5 hours! This was a short activation as we had a birthday lunch appointment with Cameron back in Vancouver’s Down Town. I about 2 hours, lots of rest stops. Cam could have done it a lot quicker without us! The lumberjack show was a treat! 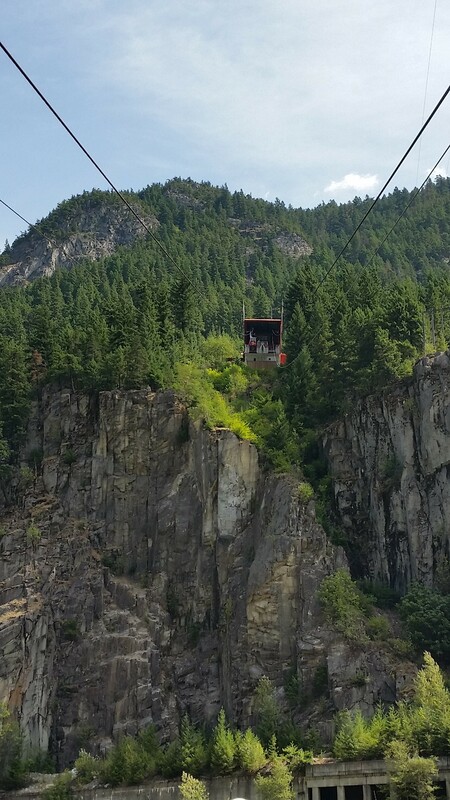 The return back down was via the Gondola (the Grind is UP Only) at the discount rate of $10.00 each. 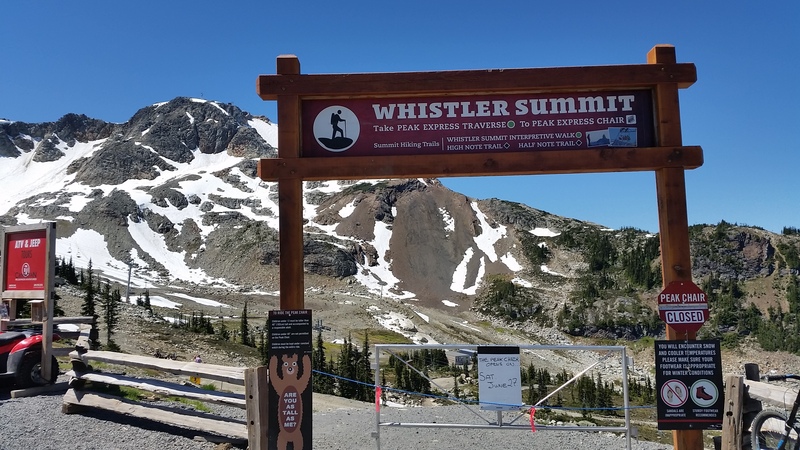 I did make an attempt to activate Whistler Mountain VE7/SL-019 (2180 metres) but this was not to be as the summit chair was not to open until the following day and there was insufficient time to make the summit, do tourist stuff plus get back in time for our bus back to Vancouver. Instead we did multiple crossings on the Peak to Peak Gondola enjoying the significantly cooler climate near the summit than back in Whistler Village. The weather throughout our stay in Canada was warm to hot. Grant, VK2GEL is the only person to have activated Whistler, mine would have been the first HF activation. Time to leave Vancouver and commence our jaunt through the Rocky Mountains into Alberta. Our Chrysler S200S certainly had more features and power than the Toyota Landcruiser HZ80J! 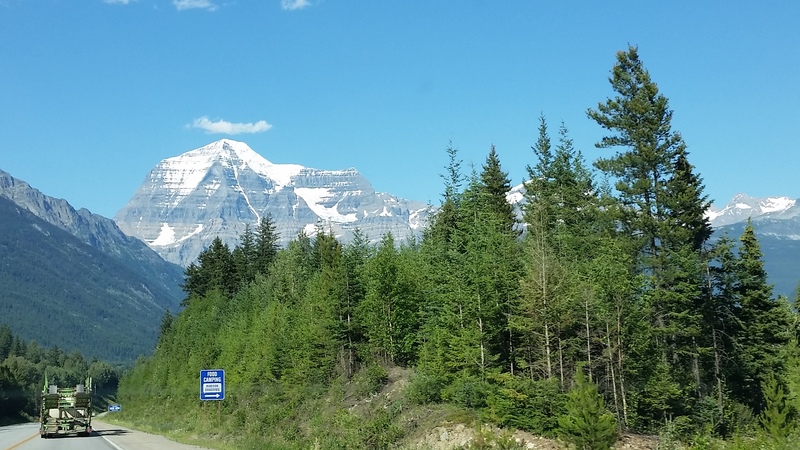 Travelling along the Trans Canada Highway and listening (NOT) to Gene Pitney we cruised towards Kamloops at up to 120 kilometres per hour up long steep inclines that would have had the 80 series gasping and the occupants all leaning forward just to help it along. Dufferin Hill overlooks Kamloops and presented us with a nice walk after the days drive. Quite hot in Kamloops, not evident whilst in the car due to climate control. 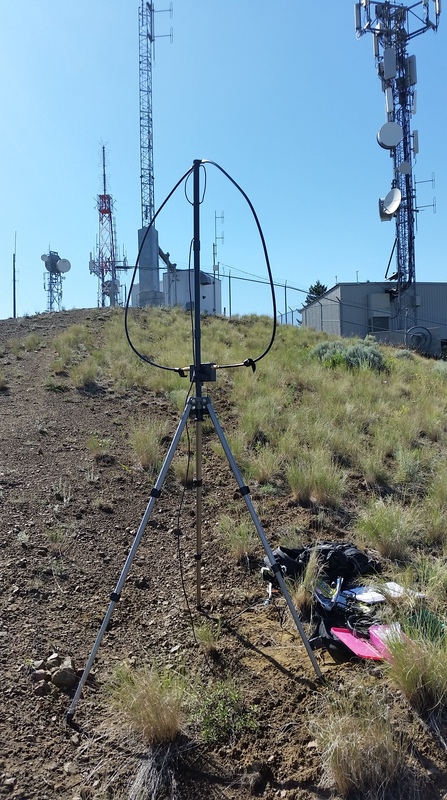 The 885 metre high summit of Dufferin Hill is also a communications site and was very noisy and hence my reception reports were a little on the low side. 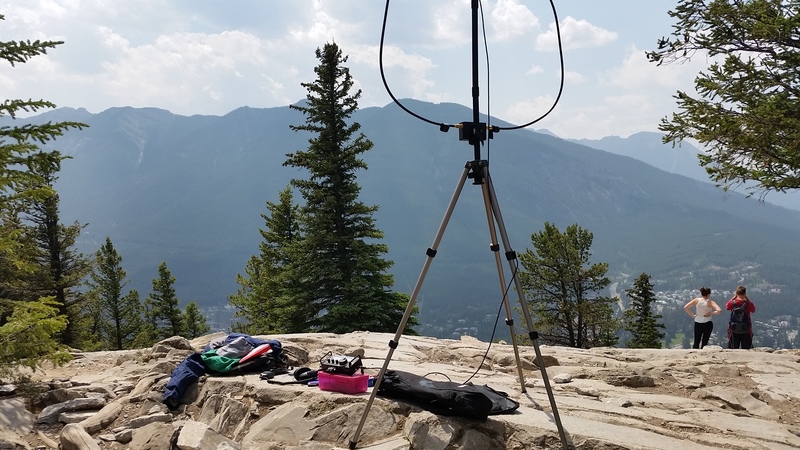 Date:01/Jul/2015 Summit:VE7/TN-022 (Dufferin Hill) Call Used:VE7/VK3CAT Points: 2 Bonus: 0 Good phone coverage. 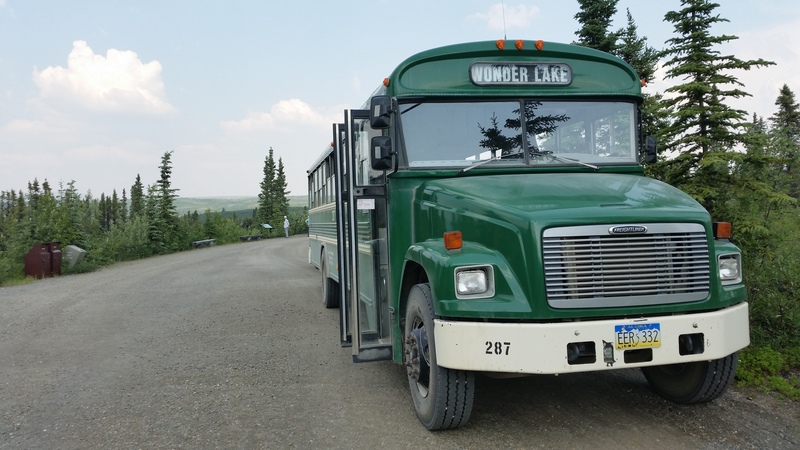 The following day out from Kamloops, we visited the Wells Gray Provincial Park with its splendid waterfalls before then reaching the Alberta border and Jasper – located in the Jasper National Park. It turned out that Nan made an inspired decision back at home by obtaining an annual family National Parks Pass. This covered us for all of the parks we visited and saved a lot of money compared to day entry rates. Will have to go back to get even more value from it! From our B&B in Jasper, we could see a building atop a mountain above us. This turned out to be the summit terminus of the Jasper Sky Tram on Whistlers Peak (2470 metres). A quick email to the Sky Tram management confirmed there was a walking trail to the actual summit beyond the terminus and that it was open. Guess where we were heading to? 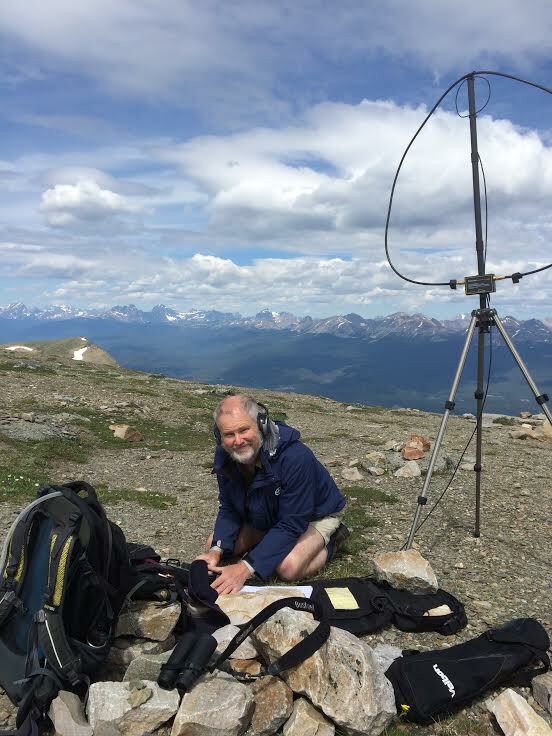 Date:03/Jul/2015 Summit:VE6/EC-001 (Whistlers Peak) Call Used:VE6/VK3CAT Points: 4 Bonus: 0 No phone coverage at the summit. Jasper is such a pretty area. The lakes and mountains are breathtaking. A favourite was a journey to Mt. 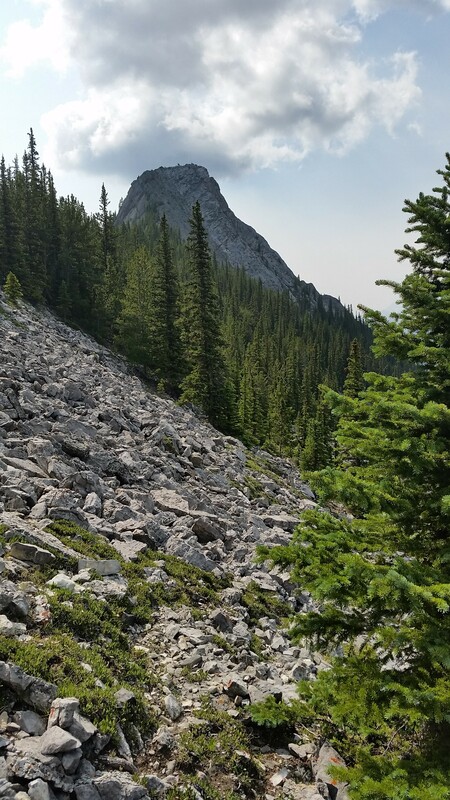 Edith Cavell (also a SOTA summit but requiring mountaineering skills – 3363 metres). 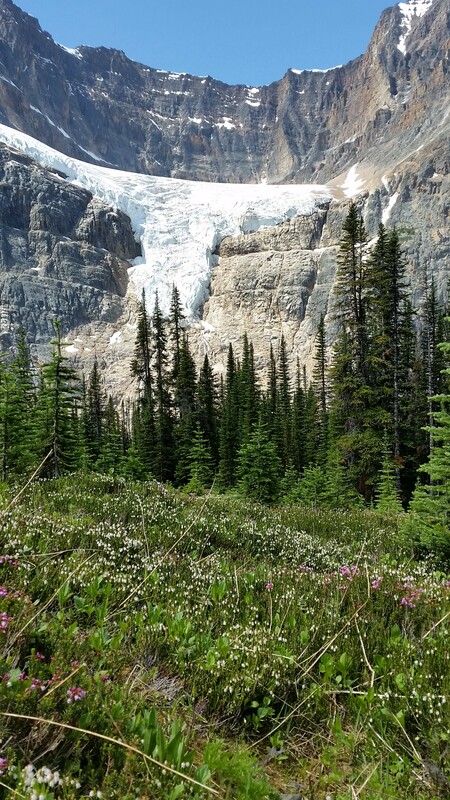 We hiked along side glaciers, mountain streams, forest and meadows. Even had patches of snow! Leaving Jasper to Banff along the Ice Fields Parkway was always going to be a slow journey. Nothing to do with traffic, just so many great sights! Finally made it through Banff via the Bow River Parkway to our accommodation at the Alpine Club of Canada in Canmore, about 20 minutes south of Banff and just outside of the Banff National Park. An earlyish start the following day. Back north and through Banff to Lake Louise, about 1 hours drive north. An early start was a prerequisite due to expected parking congestion. We were not wrong. 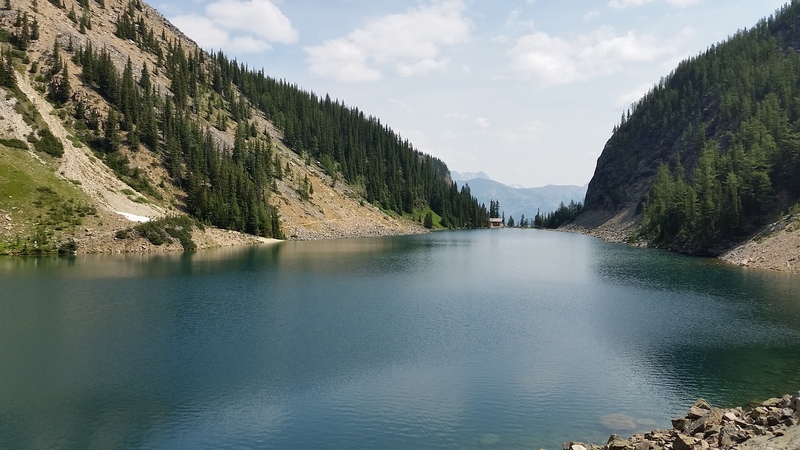 This morning was a trek to the Lake Agnes Tea House that we completed in the reasonable time of an hour; including a breif respite at Mirror Lake. The trek is 3.5 km with an elevation gain of 400 metres. Way easier than the Grouse Grind. 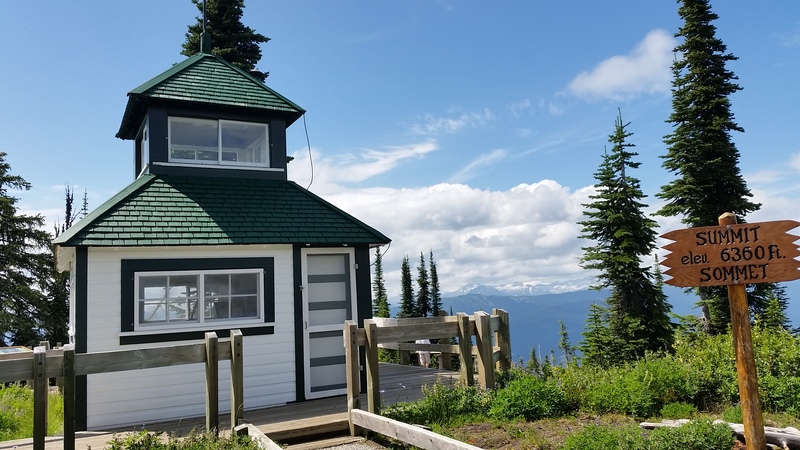 The Tea House has its origins from the Canadian Pacific Railway as a refuge for hikers. It serves fresh food prepared and cooked on site via wood stoves. The Coffee and apple crumble were yum! After morning tea we walked to the opposite end of the lake and then up to the ‘Bee Hive’ where we had our picnic lunch amongst the rocks and birds. Great views to be had over lake Agnes and lake Louise. Following this, we descended on the sometimes very steep trail with lots of switchbacks down to Mirror Lake where we had a break just watching the birds at the lake after which it was back down to Lake Louise then the journey south to Canmore. Not so much driving today. Headed to Banff with the intention of riding the Banff Gondola to Sulphur Mountain (SOTA VE6/AS-0130 4 points, 2438 metres and previously activated by VA6MCB having first failed to make it during a winter attempt. Well, the Gondola bit was quite easy, no queues to speak of due to our early start. Sulphur Mountain is not the top of the Gondola, this I knew. Sanson Peak is noted as the highest point (it is not) and is the site of Cosmic Ray Station. The actual summit is about 3 kilometres to the South. I followed an obvious trail heading in the correct direction. It avoided a significant rock scramble that would have taken me to a ridge, my Garmin GPS map indicating that I could skirt around it and pick up the trail on the other side where it dropped back down and plateaued. Wrong! My trail took me down further than I wanted and then finished on a steep side slope with lots of loose scree (does not look too bad in the photo). Having read reports of people being killed in what seemed like similar conditions on Mt Rundel, I headed back, defeated by Sulphur Mountain. My guess is that I should have climbed the first lot of rocks to the ridge and summit. In hindsight, I was not suitably prepared or equipped for this one so made the correct decision in abandoning the attempt within 1 kilometre and about 150 metres down from the summit. Even without the scree, the final ascent looks like quite a challenge!. Now back with Nan who was reading her book amongst the trees, we headed back to the bottom station via the Gondola and had our first and only Star Bucks Coffee! Next, Tunnel Mountain, right in the centre of Banff. 1692 metres and 2 points. Avoid all road sign reference to Tunnel Mountain. Instead look for the Banff Centre, Buffalo or Wolverine Streets, Julien Rd and Tunnel Mountain Drive. This is all in the south end of Banff downtown. There are two trail heads, the lower is on Julien Rd and the slightly higher with limited parking on Tunnel Mountain Drive. Nice views, good phone access, lots of summer walkers. Operate either from one of two deck chairs just below the summit or from the large rock clearing on the summit proper. Site was RF quiet. The walk took Nan and I about 1 hour plus time for lunch along the track. Not too steep but constant climb. Also note that this mountain was named on the basis of a railway tunnel that was never built. Nan perched herself in one of the two red deck chairs and read her book in the sun whilst I went a few metres higher to a clear site at the summit. I was soon inundated by curious onlookers. Much time was spent sending automated CW CQ calls whilst explaining what SOTA and amateur radio was all about. Excellent phone coverage as would be expected from this summit plus direct line of site to the Banff Gondola and Sulphur Mountain. Back towards Lake Louise today but visiting Moraine Lake. Wow is the only way to describe this lake and surrounding area. Car parking is limited so arrive early. From the moraine one gets a great overview of both the lake and the valley of the ten peaks. We also had a resident chipmunk! 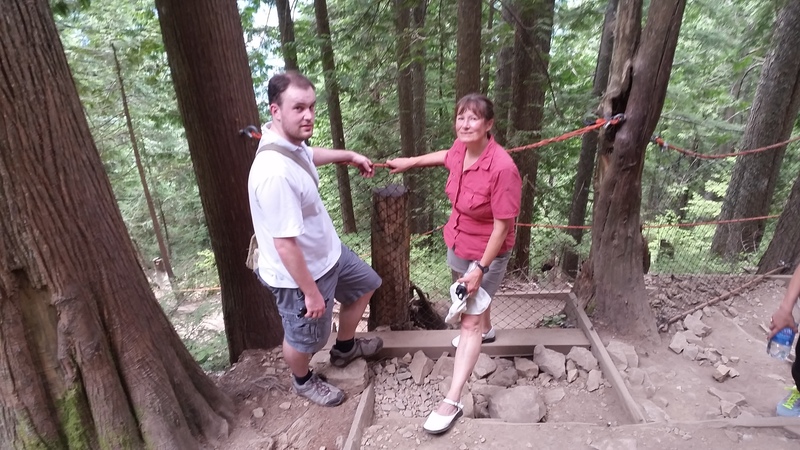 Nan and I decided (after coffee and cake) to do the Larch Valley trail. The valley is some 2.4 kilometres of strenuous climbing with an elevation gain of 350 metres. The trail continues through the valley that is renowned for the Larch Trees in autumn. In the valley is a small stream with waterfalls and lakes further up. Nan & I had a picnic lunch (watch out for bears! ), cooled off our feet in the stream then returned back to the lake. Feeling a little trekked out by now so a slow walk back to the lake then back to Canmore for a short break. picking Cameron up from the Banff Bus Depot tonight (14 hours Vancouver to Banff on the Greyhound Bus). Tomorrow we will take Cam for a look at both Moraine Lake and Lake Louise before heading to our next stop at Golden. On this trip (back on the Trans Canada Highway, we were lucky enough to view a freight train travelling through the Spiral Tunnels at Big Hill. What a weird experience seeing the same train in three different locations travelling in different directions! Our time at Golden was to be a lay day after some significant travelling and hiking. 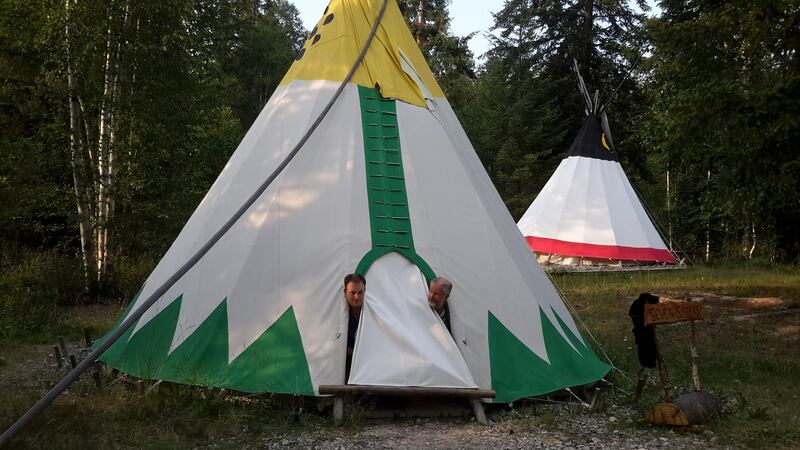 our accommodation was a Tee Pee. We had our own private lake complete with canoe. I did manage a few SOTA chaser contacts. For an antenna, I first loaded up a wire fence then compared the RX to the magnetic loop – which was much better. 11/Jul/2015 18:20 VE7/VK3CAT/P KX0R W0C/FR-020 Kataka Mountain 14MHz CW 6 1731 559, 559, Golden. It is a pity that Cam could not have come over to Banff earlier for now we are heading back towards Vancouver. Travelling to Revelstoke from Golden was interesting. For the first time we had wet weather. We stopped at lots of short walks along the way but the days highlight was to be at Mount Revelstoke National Park and Meadows in the Sky. We did all but one of the summit walks which turned out to be quite fortuitous as the weather the following day was wet and overcast with zero visibility of any of the neighbouring the summits. So, the following day we headed out in damp conditions with low cloud and low visibility towards Vernon. Instead of simply following the Trans Canada Highway we headed due south to Nakusp. This is a very scenic journey involving a ferry (two ferries in total) and a relaxing time spent at the Nakusp Thermal Springs. From Nakusp we followed the Upper Arrow Lake to Fauquier then the second ferry crossing. The road from here nearly all the way to Lumby is a drivers & riders road! Our accommodation was just outside of Vernon close to Silver Star Mountain (VE7/ON-006). A SOTA summit but not on the to do list due to available time, access etc. Thus far it has not been activated. There are a number of lifts available to the summit. 1889 metres – 4 points. A simple main highway drive, the scenery often not dis-similar to what could be seen in eastern Australia. From Hope it is an easy drive into Vancouver but there are also a number of sites to visit. The first being the Othello Tunnels. This old and now dis-used trail tunnel traverses the Coquihalla Canyon, is a major engineering feat plus a chance to view Salmon trying to head up stream. We spent quite some time just watching them from one of the bridges. Cold and wet in Melbourne. Thanks to Qantas, all of my luggage is wet. No sooner am I at home when I need to attend to a simple work call out! Black Wolf 55 litre back pack with 2 litre water bladder. The KX3 is a great versatile radio providing everything you need in a single package. No need for messy patch cords to external tuners, meters or keys. The RX is excellent and the 10 watts of RF output goes some way in compensating compromise antennas. My KX3 is fitted with Side KX panels and Cover that go along way to protect it during transportation and somewhat when in the field. After two overseas trips and just shy of 100 summits, my KX3 is looking like new. I do use a small lunch box for transporting it. Probably not as robust or weatherproof as the Yaesu FT-817. Much heavier than dedicated QRP CW rigs which would be a better choice for really serious / overnight hiking. The Alex Loop is a useful antenna. The pros are that it is compact and easily transportable. It will work all bands from 40 through to 10 metres albeit the 10 metre tuning on mine is ridiculously finicky and difficult to get a good match. I have never failed to qualify a summit with the Alex Loop. It has worked OK with NVIS propagation on 40 metres plus single hop F on 20 through to 12 metres. It is NOT a DX antenna, using it to chase DX (Sota or otherwise) can lead to disappointment. It is better when you are the DX and have been spotted! With the AUD the way it is now, this antenna will cost over $500.00. Not worth it at this price in my book! VX7-R. I like it for its size and 6 metres. Wide band RX is handy to monitor WX MW or FM radio broadcasts whilst out in the field. Short wave really needs a longer antenna. It does suffer from intermodulation interference where as the old FT-470 was immune. Pity the later is somewhere on VK3/VE-026. It does benefit greatly with using an aftermarket tri-band antenna. Garmin GPSmap62S. I like this over the Etrex due to the size and easier navigation. I still find Garmin Base Camp software quite clunky to use after 18 months. I wish it were available on the Android platform so I could use it whilst traveling. Although I use the genuine Oz Topo maps for home use, I have found OSM generic routable maps fine for our foreign adventures. I used thes in France, Alaska and Canada with contour overlays. On this trip I did purchase the Alaska & Canada road maps for my Tom Tom navigator. Not too expensive and good value when everything is strange! Black Wolf Back Pack. Purchased two of these for our Peru trip in 2013 where we hiked a small section of the Inca Trail. Subsequently mine has had quite a bit of use as the SOTA pack. Not that impressed with the constructional quality / cost ratio. My top pocket zip is now held together with gaffer tape, a belt pocket had to be cut open due to a zip failure and both water bladders needed gaffer tape reinforcing on their mounting holes. Standby for more VK Adventures soon! The view of Moraine Lake is stunning. Allen and Andrew, The Canadian Rockies were like living in a postcard. 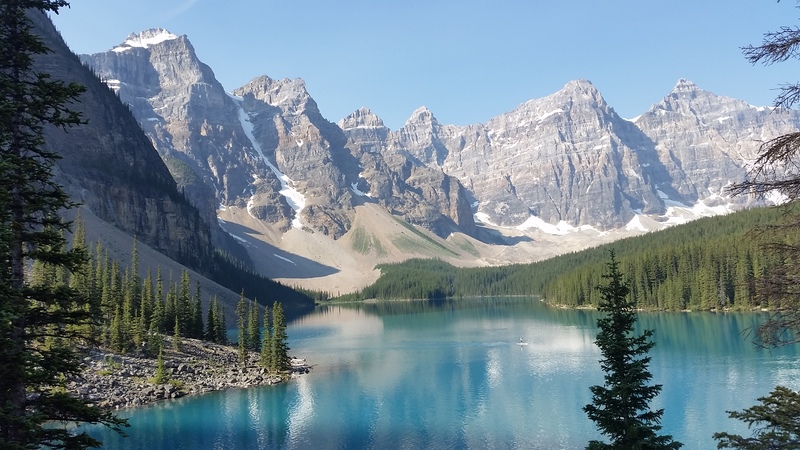 Moraine Lake topped the list. The lake was found by Walter Wilcox in search of a route to the summit of Temple Mountain ( VE6/GS-001 3544 metres), to the NW of where this photo was taken – photo is looking SW. The Valley of the 10 peaks – summits Mt Babel VE6/GS-016, Quadra Mountain VE6/GS/013, Mt Fay VE6/GS-012, Mt. Little VE6/GS-015, Mt. Bowlen VE6/GS-019, Tonsa Peak VE^/TS-021, Mt. Allen VE6/GS-009, Mt. Tuzo VE6/GS-010, Delta Form Mtn. VE6/GS-008 & Neptuak Mtn. VE6/GS-011. Heights are from 3053 to 3426 metres. Allen your mountain is 3280 metres and in photo centre. Could a visit be in order?. 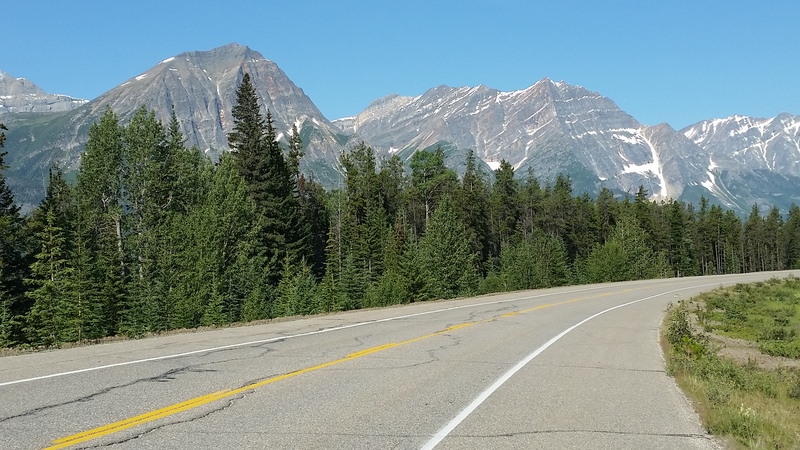 This mountain chain forms the VE6 (Alberta) and VE7 (British Columbia) border. None of these have been activated and each is worth 10 points. Great to read your story and see those great photos. Moraine lake, and Mirror Lake photos were very striking. thanks for the comments on GPS, tomtom maps and the radios too, Tony, all very good info.